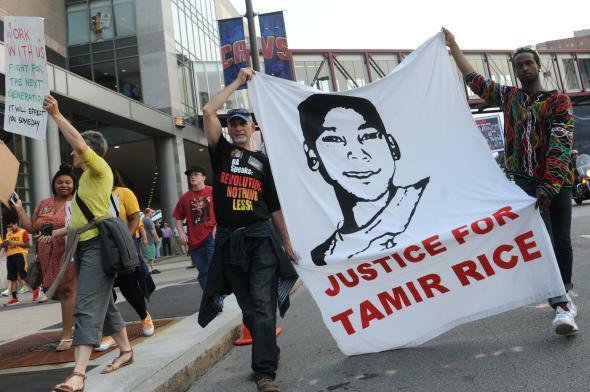 Tamir Rice officers not arrested: Prosecutor still controls case of Timothy Loehmann and Frank Garmback, judge says. Demonstrators outside of Cleveland’s Quicken Loans Arena prior to game three of the NBA Finals on June 9. Resort to this statutory process does not provide an “end around” either the City or the County Prosecutor. The statute provides this court the ability to review affadavits filed by private citizens for sufficiency and good faith … That statutory schema does not, however, provide the court the ability to require that its determination be substituted for the discretion either of the City or the County Prosecuting authorities. “The trial court does not have the option of unilaterally issuing a warrant on its own initiative in these private citizen initiated cases,” Adrine wrote. The activists’ request was an effort to expedite the process by which Loehmann and Garmback’s case is brought before a grand jury; a grand jury is the only body in Ohio that can issue felony indictments to bring suspects to trial. Despite Adrine’s acknowledgement of probable cause, for now it appears that the pace of the potential prosecution will remain under the control of the same authorities that had control all along. Update, 5:50 p.m.: I’ve changed the word “arrest” to “charge” in the body and headline of this piece for clarity. Having enough evidence to charge someone also means there’s enough evidence to arrest them, so the previous wording wasn’t incorrect per se, but the judge’s ruling focuses specifically on the issue of charging.